This wonderful energetic work by Jean Dufy shows people going about their day on the right bank of Paris. On the other side of the Seine, in the background, the Palais Bourbon, the home of the National assembly, is glimpsed. In the centre on the right hand side are the pillars of the Pont Alexandre III. This wonderful energetic work by Jean Dufy shows people going about their day on the right bank of Paris. On the other side of the Seine, in the background, the Palais Bourbon, the homeof the National assembly, is glimpsed. In the centre on the right hand side the pillars of the Pont Alexandre III are seen. However, it is not the view of Paris that is the focus but the activity of ordinary Parisians. On the lower right hand side, Parisians air their newest toilettes whilst in the centre workers go about their day repairing or sweeping the quay. Au Bord de la Seine provides a snapshot into the daily working life of ordinary Parisians. Dufy often depicted people enjoying themselves in a bright colourful manner and he became best-known for his panoramic views of modern Paris, capturing the architecture, activities and electricity of the city. The Place de la Concorde was one of the artist’s favourite subjects, appearing in dozens of canvases he created from the 1930s through the 1950s. Here, Dufy has depicted the quay running right by the square using his signature stylized figures capturing its energy while focusing on such national symbols as the Palais Bourbon and the Pont Alexandre III. 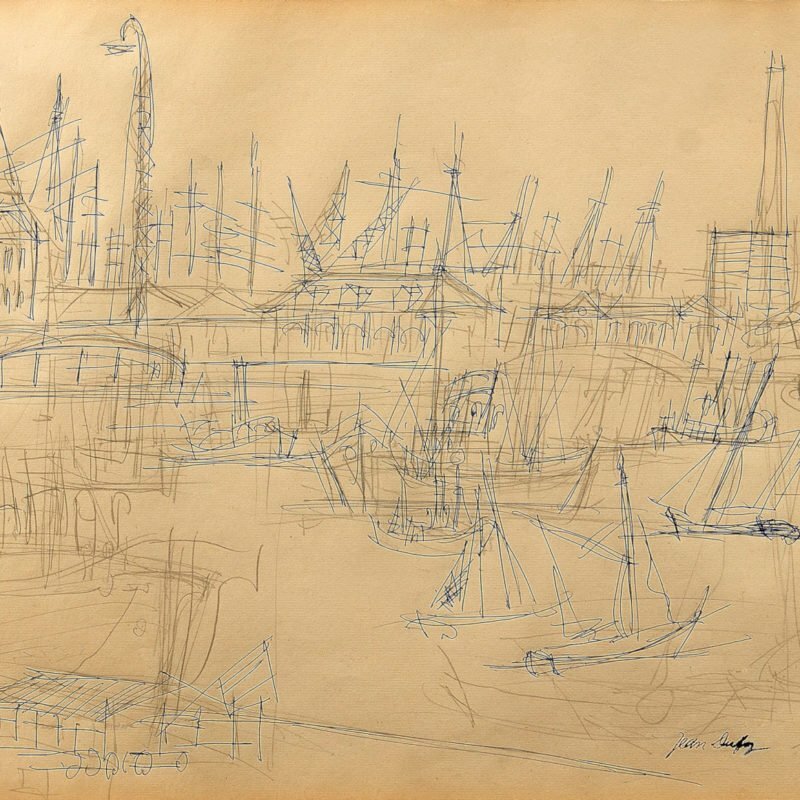 Jean Dufy was born in Le Havre in 1888 and came from a large, musically as well as artistically, very talented family. His older brother was the well-known painter, Raoul Dufy. Dufy’s career began with a mercantile apprenticeship – he only gradually discovered his love of painting. When visiting an exhibit in Le Havre in 1906, featuring impressive works by Matisse, Derain, Marquet and Picasso, he decided to become a full-time artist. When he returned from military service in 1912 he moved to Paris. In 1914, Jean Dufy presented his watercolours for the first time in the Galerie Berthe Weill, receiving great recognition. After this success he was encouraged to work tirelessly on his paintings of landscapes, animals and flowers. By 1916, Raoul and Jean Dufy worked together for textile studio Bianchini-Férier, also developing flower and animal designs for the Lyon porcelain manufacturer Théodore Haviland de Limoges for thirty years. In 1925, Jean Dufy received the Gold Medal at L’Exposition Internationale des Arts Décoratifs for designing the porcelain service “Châteaux de France”. He exhibited consistently for the subsequent years. In 1950-60, Dufy took numerous trips abroad, and his impressions from these were reflected in his work. He died on 12th May 1964 in La Boissière in France.